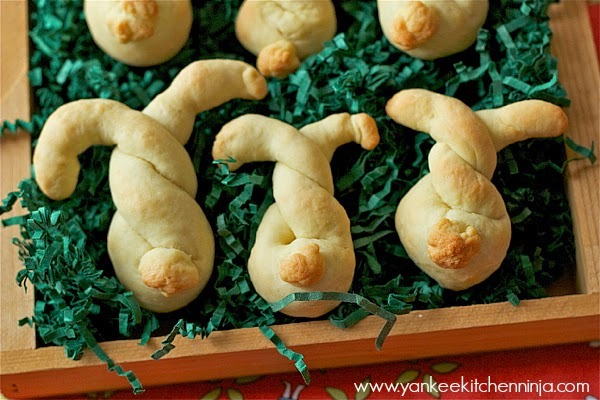 Taralli are simple, buttery, traditional Italian cookies, often made for Easter, reminiscent of scones and, when unglazed, perfect for a not-too-sweet breakfast or cocktail cookie. In my family, these cookies have always simply been called "Mom's Italian cookies" and they were always made for Easter (and sometimes Christmas). It was years before I realized that a) they were a traditional Italian cookie that other Italian families besides ours knew about and b) they had a name: taralli (although there are umpteen variations on how to spell it). They are very buttery, cakey cookies, simple to make and amazingly delicious in their simplicity. This is a recipe that lets the good, natural taste of butter really shine through (I have since seen other recipes for taralli that call for almond or lemon extract, but I prefer this simple buttery taste). They don't have much sugar in them, so they are not very sweet. In fact, I prefer to eat them for breakfast, as they are almost more like a scone than a cookie. Similarly, they make a great cocktail cookie or afternoon tea cookie. However, if you have a sweeter sweet tooth than I, you can certainly ice them. Growing up, we always iced them, with a simple glaze made from confectioners sugar, moistened with a little lemon juice and milk -- just enough to make a thick liquid to spoon over the cooled cookies. And, as they were Easter cookies, we added a drop or two food coloring to some of the glaze to make them pastel shades of pink, green and yellow, as well as white. Since I now eschew the icing and with a nod toward their being a traditional Easter cookie, I decided to be cute and turn the traditional twisty taralli shape into a bit of a bunny (at least I think they look like bunnies -- Mr. Ninj was not entirely convinced). 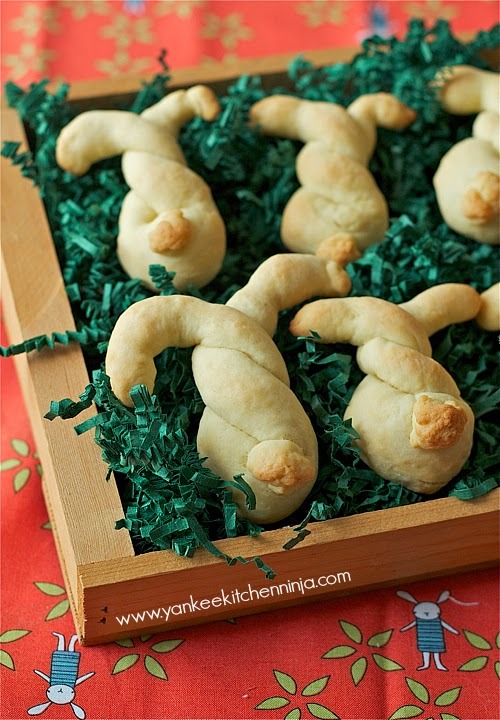 I really worked hard to perfect my bunny shape: with each batch that came out of the oven, I'd shout, "BUNNY CONSULT!" and Mr. Ninj would come judge which cookies looked the most like bunnies -- then we'd discuss how we should tweak their ears or little dough cottontail butts to perfect the shape. Bunny science, if you will. 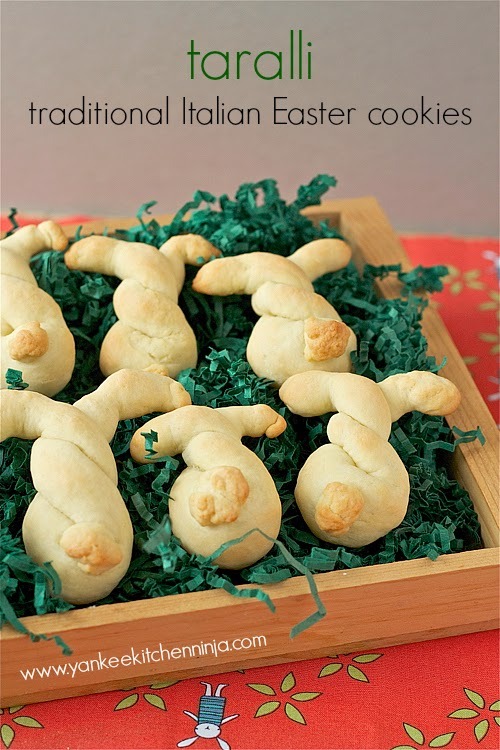 But (ha ha ha) if you're not so into bunnies or want to make taralli for an occasion other than Easter, simply turn the dough into a braid or twist. But (ha ha ha) come on, those bunnies are damned cute, aren't they?!! In a medium bowl or the bowl of a stand mixer, beat together the eggs, sugar, vanilla, salt and melted butter. Sprinkle the baking powder over the surface, then add the flour and beat on lowish speed until combined. Turn the dough out onto a lightly floured work surface and knead until smooth and shiny (less than a minute). Pull off a ping-pong ball-sized portion of dough and roll it with your hands into a pencil-thin strip. Twist the strip into a knot or braid. To make the bunny shape shown, twist the dough and then shape the ends into floppy ears. Cut off another tiny piece of dough, roll it into a ball and place it on the bottom of the twist for the tail. Bake in batches for 10 minutes on a parchment-lined baking sheet until cookies are just barely beginning to brown (check the bottoms). Cool on a wire rack. If you want to ice the cookies, make sure they are completely cool. To make the glaze, combine 2 cups of confectioners sugar in a bowl with a squeeze of lemon juice and just enough milk to create a thick liquid. Spoon over the cookies and let harden. These are just beyond adorable. I'm not sure if my clumsy hands can handle the delicate twist and deliver something vaguely resembling a bunny as you have done so well here but looking at these delights sure makes me want to try! I also have to mention how excited I am to discover your book list.... I'll be cross-referencing and looking out for some new goodies -- yay! If you have book suggestions of your own for me, please let me know!! Mr. Ninj is blind, those are CLEARLY bunnies!! And thanks for giving mom's cookies a name! I actually always preferred the raw dough to the actual cookie, but now that I'm grown I think these would be excllent with some hot tea. Mmmmm. OK, the raw dough thing grosses me out -- but you should try them again! That is why you're so skinny and I'm a round ball.